All of that is not to say that there is no significant difference between Cool Mint Creme Oreos and Peppermint Creme Oreos: They are the same price on the shelf, but the package of Cool mint Oreos is 15.25 ounces (30 cookies), and that of Peppermint Creme Oreos is 10.5 ounces (20 cookies). So Peppermint Creme Oreos cost 45 percent more per ounce — or 50 percent more per cookie. Whoomp! There it is! Math, baby! Inspired by his example, I’m prepared to turn up the heat on Nabisco’s Oreo division. Are you ready? Double Stuf isn’t double stuf. 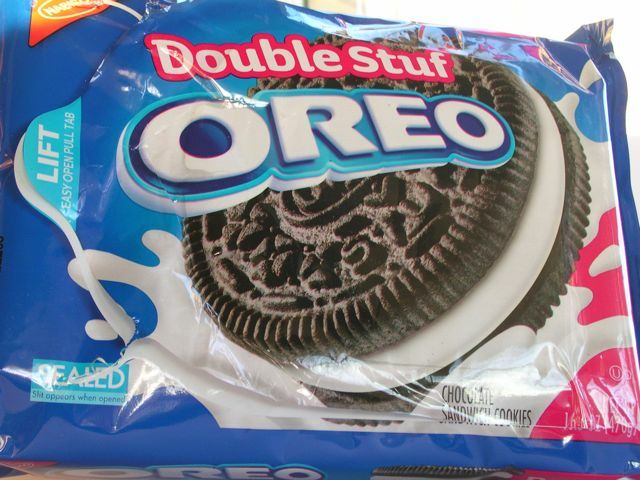 Let me say that again…DOUBLE STUF IS NOT DOUBLE STUF! How do I know? Math. How should we do this? Reductio ad absurdum? Let’s assume it is double stuf. Then, according to Nabisco’s own data (found on the Nutrition Facts), one serving of Oreos is 3 cookies and 160 calories. Double Stuf is 2 cookies and 140 calories. Let me translate that for you. One serving of regular Oreos has 6 wafers, 3 stufs and 160 calories. Meanwhile one serving of Double Stuf Oreos has 4 wafers, 4 stufs and 140 calories. That’s hard to compare. So let’s consider two servings of regular Oreos (6 cookies, 12 wafers, 6 stufs, 320 calories) and three servings of Double Stuf (6 cookies, 12 wafers, 12 stufs and 420 calories). Those Double Stuf Oreos account for 6 additional stufs and 100 additional calories (same number of wafers, remember). We conclude that each stuf is approx. 17 calories. And from this we can conclude that each wafer has approx. 19 calories. You’re comfortable with that. No problem, right? Tune in tomorrow for the dénouement. This entry was posted in Problems (math) and tagged al sicherman, double stuf, groceries, nutrition facts, oreos, star tribune, startribune, strib, wcydwt. Bookmark the permalink. Nice!!! I think I may spin this idea for my AP Statistics class but will absolutely use it in my Algebra 2 class. Thanks!!! How old is Al Sicherman? It seems like he’s been around forever. Anna, I don’t know Al’s age. I’m guessing not a day older than 39! I’m hoping he’ll stop by; couldn’t find his email address through the STrib website, so I tweeted the address for the Taste section to invite him for a read. I’ve got another junk food based system of equations application up my sleeve. I probably won’t get to it before next week, though. Stay tuned. Ooh! We have a wonderful cookie in Australia called the Tim Tam (you haven’t lived if you haven’t had a packet – Aussies ship them to friends in US in ‘care packages’) who also do a ‘double choc’ version. Will have to try this in my algebra classes this year! Thanks for the idea. Mmmm…Can’t wait to try a Tim Tam. First, thanks for the very kind words. The new-groceries beat is full of examples of one kind of stupidity or another, but the Oreo is the easiest and silliest target I have been lucky enough to glom onto. I wasn’t aware of your blog until you let the Taste section folks know about it, and I admire your willingness to stand up and be seen with a figurative slide rule in your hand. All that said, I’m afraid I have to disagree with your conclusion about the Double Stuf Oreo. As you noted, having reached a contradiction means that something in your original formulations was wrong, but it wasn’t necessarily your assumption that double stuf is truly double. You also assumed that the chocolate and vanilla stufs in the Triple Double are the same, which they probably aren’t (two Chocolate Double Stuf Oreos are 150 calories, not the 140 of the vanilla Double Stuf). It could also be the assumption that the wafers are all the same (they may not be; see below). Or it could be any two or all three of those assumptions. Or something else neither of us has thought of; the world is unfortunately full of unrecognized assumptions. About the wafers: A comparatively simple exercise (less simple but far more stupid exercises follow) demonstrates that, at least, they are different in diameter: Attached photo No. 1 shows a row of 10 original Oreos and one of 10 Double Stuf Oreos edge-to-edge. The top row (the Doubles) is a good 1/2 inch longer than the row of original Oreos. Another measure — stacking a whole bunch of wafers devoid of their glop — appears to indicate that all are the same thickness -– eight of either kind measure about 1 1/2 inches, for a thickness of 3/16 inch per wafer. But nothing says that they are the same density. And in fact, the closeup shot, not flash-lit (photo No. 2), reveals that the Double Stuf cookies are slightly lighter in color, a possible indicator of less density from more air –- or maybe from less cocoa. This is where, in a perfect world, I (or my dashing — and much younger — alter ego, Mr. Tidbit) would provide a collection of stunningly dramatic (or at least consistent) numbers: weights of wafers, single fillings and double fillings. Unfortunately, even weighing a bunch of each item together failed to overcome many problems: the amount of filling I left behind on scraped-off wafers, the amount of wafer crumbs that got weighed with the filling, the horrible performance of my cheap digital scale (which repeatedly produced different readings when reweighing the same stuff), and the distinct, but untested, possibility that (gasp!) there might be some variability between batches of Oreos. As close as I came, anyway, surrounded by the litter of broken Oreo wafers and little piles of Oreo glop (see photo No. 3), was to conclude that it is quite possible that Double Stuf Oreos indeed contain twice the stuf. My best evidence of that follows not from all that pointless weighing but from noting that a stack of nine Double Stufs is approximately the same height as 11 originals: about 5 3/16 inches. The following discussion ignores the possibility that the diameters of the double filing and the original filling might be different, so even if the height of a Double Stuf filling is twice that of an original filling there might be a difference in the total amount of glop involved. I ignored that possibility because I didn’t think of it until just now –- and it’s too late to measure because, to the dismay of my dog, I have pitched all the bits of cookie and filling, and one package of each kind of cookie is as much as I care to invest in this enterprise.